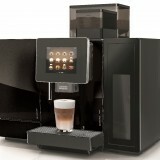 For a high output coffee machine one of the most powerful and cost effective combinations that is available for busy cafes and restaurants in garden centres, hotels and busy visitor attractions is surely shown in this superb video demonstration of a pair of the new high performance Jura Giga X8 Generation 2 bean to cup coffee machines with fresh milk and the Matrix Hot Chocolate machine. 2. No huge power needs – all machines are on 3-pin sockets and easy and quick to install. 3. Contingency – you are not stuck if one machine does go down as you have 2 more! 4. Delicious hot chocolate – in 2 cup sizes, a great favourite for children, easy, consistent and quick to dispense. 6. 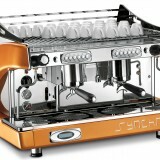 Capacity – loads of hot water for tea, 3 kilos of coffee beans, 8 litres of fresh milk, 1 kilo plus of hot chocolate powder. 7. Price – excellent value – whole package @ £12,760.00 + VAT installed with water filters. 8. Easy to clean – simple programming to check how many drinks are made. 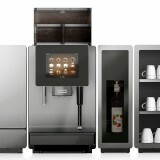 We also offer this high performance coffee machine package with its extended warranty on a 3 year lease-rental deal to spread out the costs of ownership, typically this costs around £425.00 + VAT per month total. Thanks for watching our trial video of two Jura Giga X8 Bean To Cup Coffee Machine and a Matrix Hot Chocolate Machine which we enjoyed shooting at our Falkirk showroom – now can we help you further?